When I was a young mother I wondered why those with older children seemed to not have much to share or say. Now that I am that mother celebrating a homeschool graduate – number two – I know why. Life is super busy. It is a different sort of busy from the survival-in-the-trenches days of babies and toddlers. It is stage of life, a stage of parenting that is so very full and so rich in a completely different way. With a calendar that is every bit as full as well. With days that start early and usually go late into the night with talks with young adults. These two eldest children of mine – now homeschool graduates! Pictured at the High Museum of Art, Atlanta. 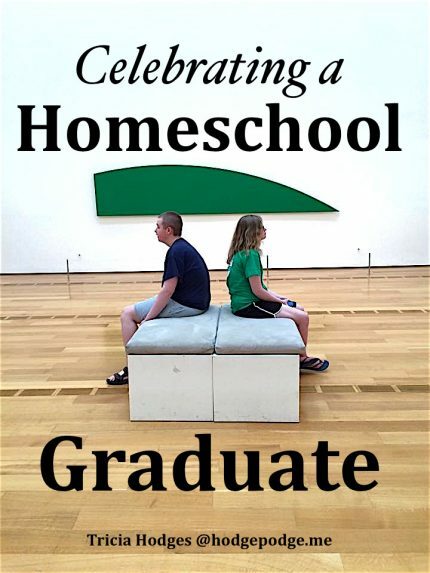 Homeschool Graduation Favorites – I shared these last year with our first graduate. Our son has chosen a much more low key approach to graduation. As I shared in my January homeschool wrap up post on learning styles, our second born has a different path than his sister. Right now he is looking at an apprenticeship and some other opportunities including some online education. We are excited for him and praying with him for wisdom while continuing to ask the Lord to direct his steps. His graduation ceremony will be our senior recognition Sunday at our church. We will have a nice, Sunday dinner with extended family and celebrate. Then we will go on a family trip sometime this summer. We have a lot to celebrate with our second homeschool graduate, our daughter finishing her first year of college and all of our children doing so well this year! Plus a drama troupe production and piano recital! We had two sets of wisdom teeth extracted. That’s pretty big! Fifth grader performed in big church with her handbell choir. We went to see college girl perform Handel’s Messiah with her choir and on a short couple of days tour of north Georgia. We also got to see my Dad up in those north Georgia hills. All the extra light in the evenings for walks. Plus watching all the spring flowers and growing things start to turn towards summer. I’m ready! Finishing up some subjects is really working. Our elementary children are almost finished with Teaching Textbooks. Our weekly homeschool planning meeting is a good anchor for our week and keeps us accountable. It sure will be very different only homeschooling three next year. One high schooler, one middle schooler and one elementary student. A span! Next up… Seashore and the start of the history cycles you have been asking for. Weekly Facebook Live chalk pastel art tutorials. These have been such a huge blessing! We love seeing photos from families and hearing about how much they are building a love of art. We look forward to our May the 4th Be With You event next week. Are you finishing your homeschool year in the next couple of weeks too? So many special times this last week! So thankful we can tailor each celebration specifically for each child. Thank you, Shirley! Excited for you too! Please keep us informed about how a modern apprenticeship and homeschool college or online college looks for those of us a few years behind you.